Soho is one of last neighborhoods I expect to find good Thai food but just a few steps below street level is a wonderfully exciting spot called Uncle Boon’s. It took a while for our eyes to adjust to the dark interior so for the first few moments, delicious flavors welcomed us to Uncle Boon’s. The restaurant was lined with exposed brick wall and eclectic artworks and lights in every shape and form. 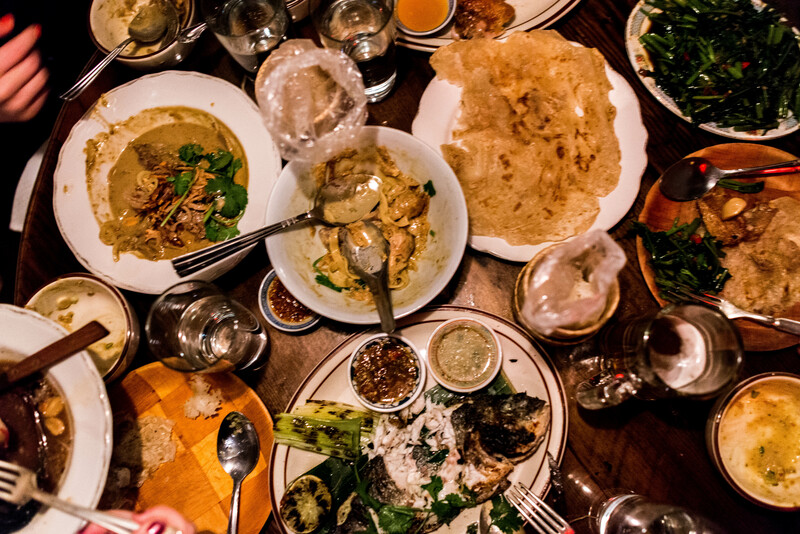 The funky personality of the Thai rotisserie translated into the dishes on the menu. Instead of your typical Thai standbys, the menu was full of surprises such as frog legs and this sweetbread mee krab. 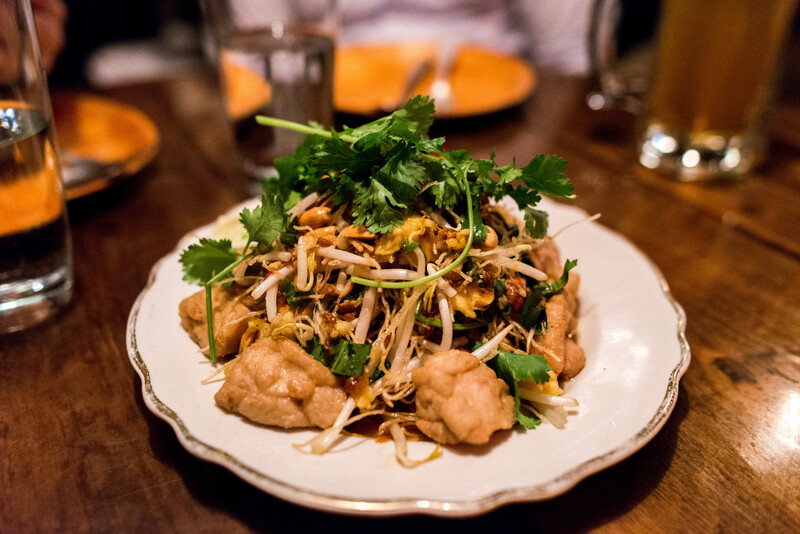 Chunky crispy pieces of meaty sweetbread sat atop a crispy crunchy noodle salad with dried shrimp, eggs, sawtooth herb and tamarind sauce. The sweetbreads weren’t for everyone so I happily devoured them on my own. From the charcoal grilled goodie section, the sai krok ampai was a more popular choice that my companions appreciated more. 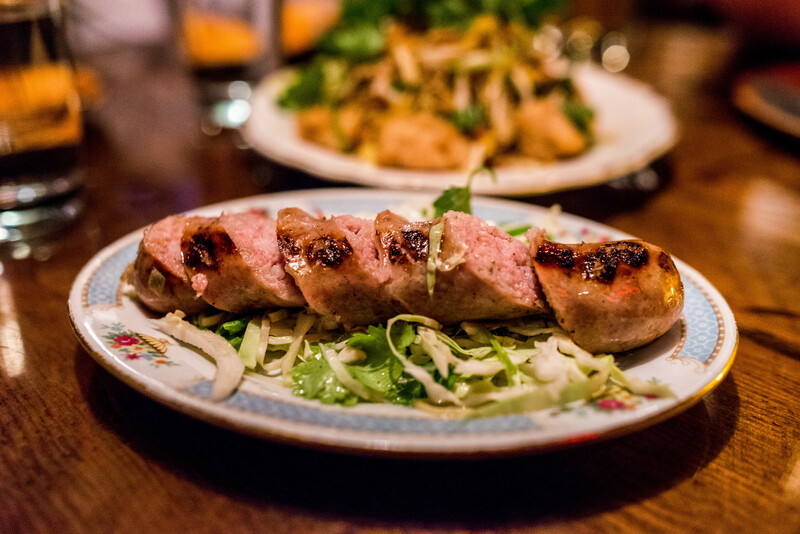 The meaty pork and rice sausage was kissed by the hot grill which left a beautiful mark. The inside was everything one would want from a sausage, juicy and flavorful. 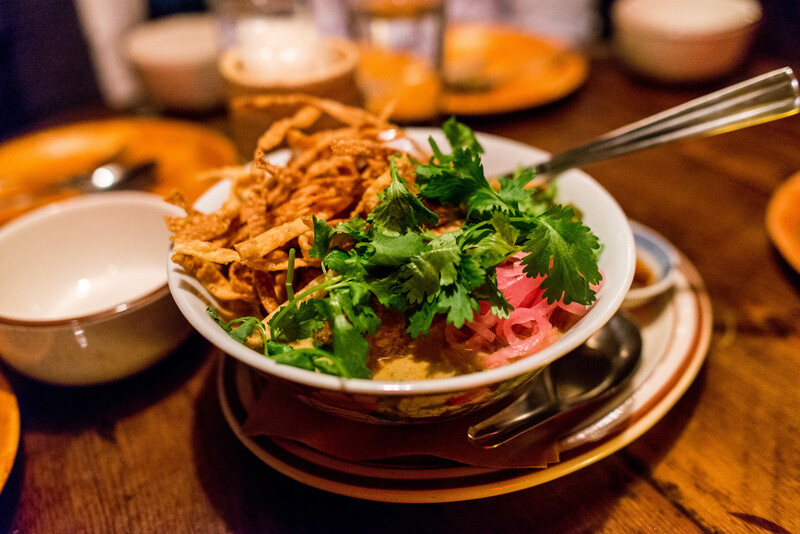 The khao-soi kaa gai, a Northern style golden curry, was one of the few noodle dishes on the menu. The thick gentle curry coated each thick strand of the supple homemade egg noodles. Digging a little deeper will reveal the most tender piece of chicken leg, full of flavor from the curry, falling apart with the touch of the fork. 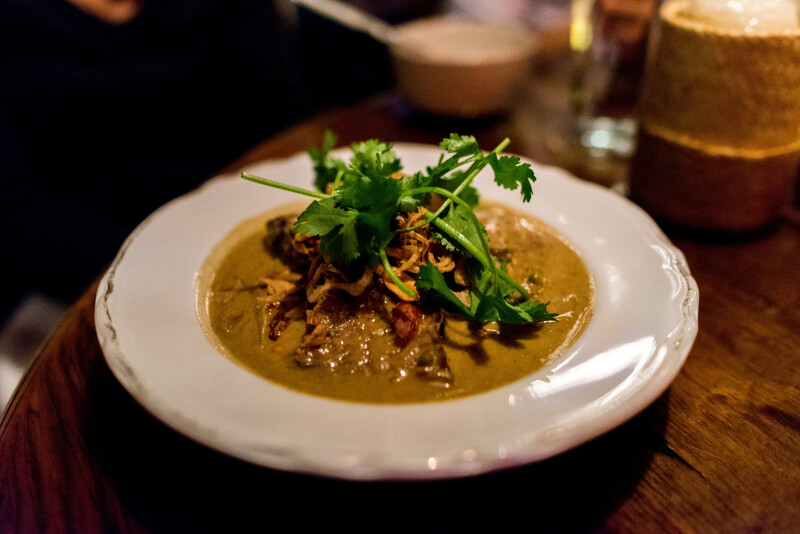 The boneless beef ribs here were served a lovely Massaman curry, potatoes and green peppercorn. Just like the chicken, the meat was cooked until it was at the tip of tenderness. 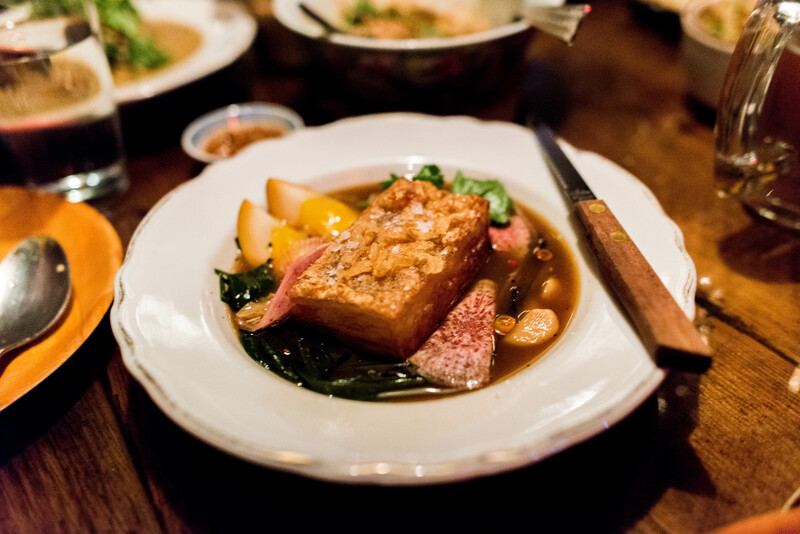 Just because we didn’t have enough meat, an order of the pork belly seemed like the obvious choice. The flavors were lighter, a thinner broth rather than the curry sauce from the first two. Even though we appreciated the different flavoring, the pork belly didn’t nearly stand up as well to the noodles or the beef rib. Even though I was skeptical when our waitress suggested the grilled dorade to round out our dinner, it turned out to be a wise decision. The fish was presented to the table whole, head and tail and all. 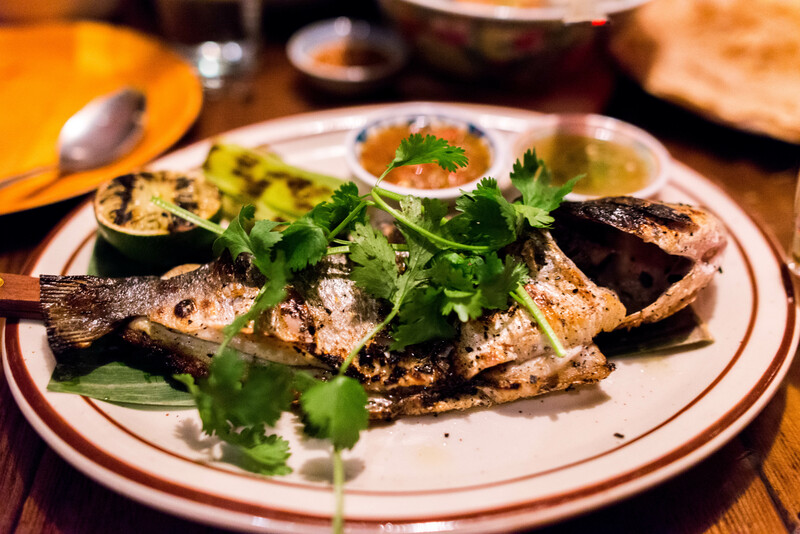 Grilled simply and served with charred leeks and two nam prik dipping sauces, the flaky flesh of the dorade was milky and tender, perfect juxtaposition to the heavier meat dishes. 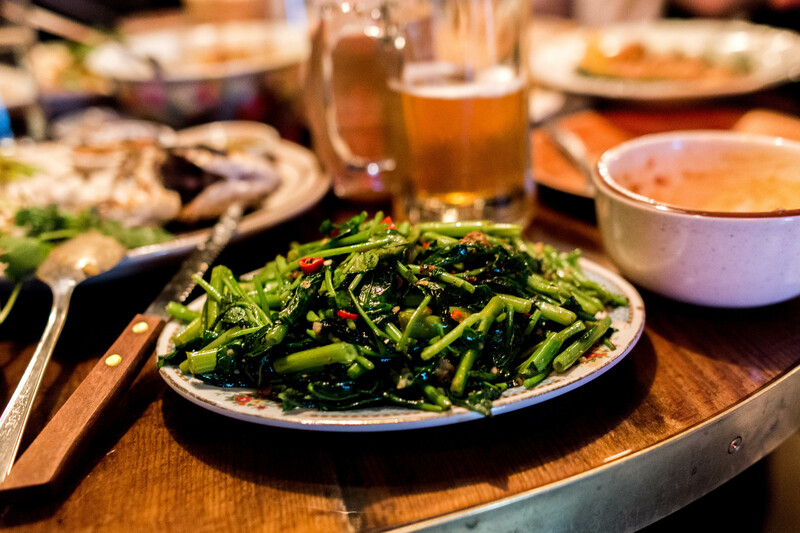 To offset all the protein, a plate of sauteed water spinach with garlic, chilies and yellow soybeans was just the thing. Don’t be fooled by the few red chilies that stud the generous plate, they packed such a punch that could not be ignored. I reached for the sticky rice almost immediately but couldn’t stop eating it, bite spicy bite after another. The food here came at such a pace that we had a hard time keeping up. In the end, we had filled the round table full of plates and bowls. Just like how a good family meal should be.